Ashley Juavinett is a singer-songwriter originally from the Philadelphia area. 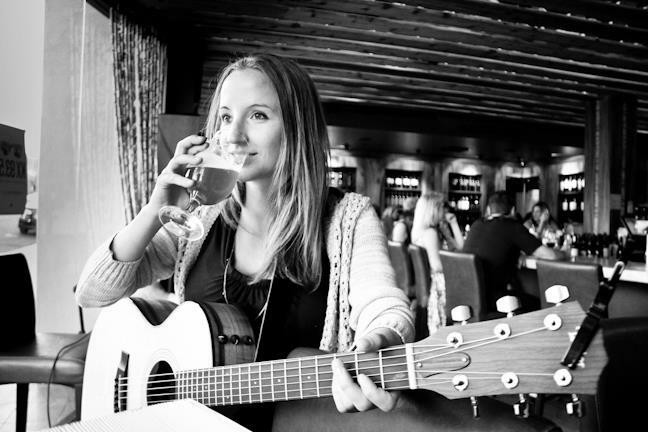 Ashley’s music has a dynamic range of styles, from edgy and upbeat to smooth and jazzy. Listeners have compared her to KT Tunstall, Jack Johnson, and Ani DiFranco. To have a listen, check out her music on YouTube or SoundCloud. Over the past decade or so, Ashley has performed at a variety of venues in South Jersey, Philadelphia, Easton, and New York City, and San Diego (list below). Working closely with the late Chris Phillips, she released her first 5-song demo, Twenty Miles to Freedom EP in January 2010. In December 2010, she was named a winner of World Cafe Live’s weekly open mic and was featured in its August Sunday matinee showcase. While living in San Diego, Ashley jumped into the local scene, with a few plays on the late Sophie 103.7’s Unsigned Sundays program. In January 2012, Ashley released her first full-length album, Skies Apart. Marked by pure song writing, catchy melodies, and even a bit of beatboxing, the album has been getting some local attention, including an interview with Laguna Beach’s KX93.5. During her time in California, Ashley also had the pleasure of playing with a group of talented individuals collectively known as The Dark Matter Turtles. Venues played include: World Cafe Live (Philadelphia, PA), Coffee Works (Voorhees, NJ), Lickety Split (Philadelphia, PA), Café Vivaldi (New York, NY), Porter’s Pub (Easton, PA), and State Café & Grill (Easton, PA), House of Blues (San Diego, CA), Mosaic Bar & Grill (San Diego, CA), James’ Place (La Jolla, CA), The Loft (La Jolla, CA), Wine Gallery Laguna (Laguna Beach, CA), The Wine Lover (San Diego, CA), Lestat’s Coffee House (San Diego, CA), Bourbon Street (San Diego, CA), South Park Abbey (San Diego, CA).